Studio ORD’s design proposal selected for the new O’Hare Global Terminal in Chicago. Studio ORD has been selected to design the new O’Hare Global Terminal and Global Concourse in Chicago. This follows a competitive process that shortlisted five architect teams last year. The city will now enter into contract negotiations with Studio ORD, a joint venture comprising Corgan Associates, Milhouse Engineering and Construction, STL Architects, Solomon Cordwell Buenz & Associates, and Studio Gang. Upon contract award, Studio ORD will work with the City of Chicago and the airlines to design the new terminal and concourse. In the coming months, a second team will be selected from the remaining four finalists to design two new satellite concourses to be built west of Terminal 1. This $8.5-billion expansion program will elevate the travel experience for more than 83 million passengers and create tens of thousands of jobs for the community. The expansion will be paid for by airport revenues. advanced new technologies to improve security screening. For the first time at O’Hare, the new terminal will integrate international and domestic operations. 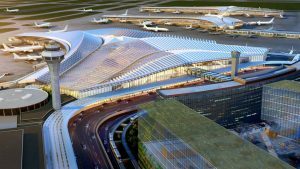 The O’Hare Global Terminal is valued at $2.2 billion and is currently slated to break ground in 2023. Copyright ©2019 Construction Specifier unless otherwise noted.